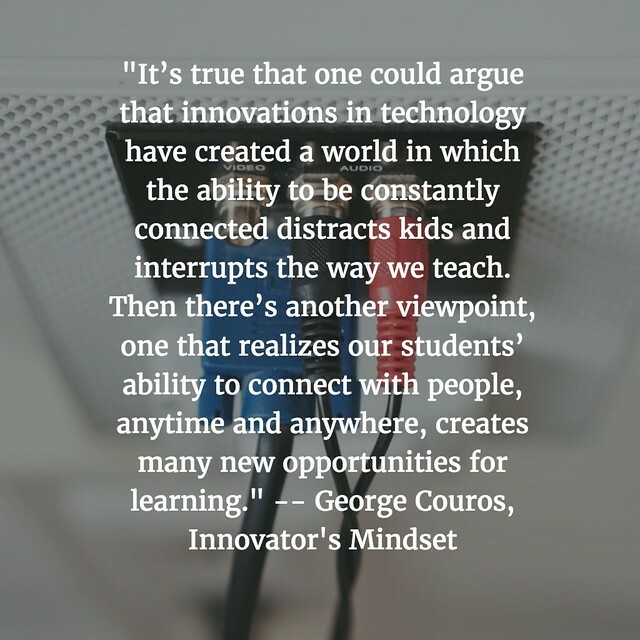 We’re somewhere in the middle of the Innovator’s Mindset MOOC, but I am not sure where things are because I keep forgetting to pay attention to what chapter I am on. 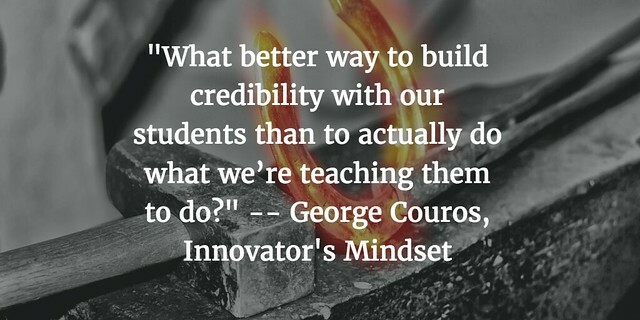 I am pretty sure I have read ahead in George Couros’ book — The Innovator’s Mindset. I don’t think it matters. It’s a MOOC, after all. Yesterday, I followed a digital path from the Kindle app on iPad (where I am reading The Innovator’s Mindset book) … to the Amazon Kindle website where my highlighted annotations are housed on the Web … to the Pablo visual quote-making site so that I could “visualize” some of the highlights … to Flickr to host the quote images and then … back here to share the quotes. I’ll be hitting the “share” button one more time, pushing the post into my social media networks with a mouse-click. That’s quite a path across platforms just to share a few words I didn’t even write, and yet, it did seem rather seamless. It’s true that while one BIG APP would be helpful for accomplishing all that (read-highlight-quote-share), we adapt to what is available to us and use it as we need. And I have been walking this path of sharing from one platform to another for some time. The quotes sprinkled here in this post center on ideas that I want to hold on to, as best as I can. And if you look closely at the quotes I am sharing, you will see the message in them (exploration, reflection, possibilities) dovetails quite nicely with the message I am writing here for Slice of Life. 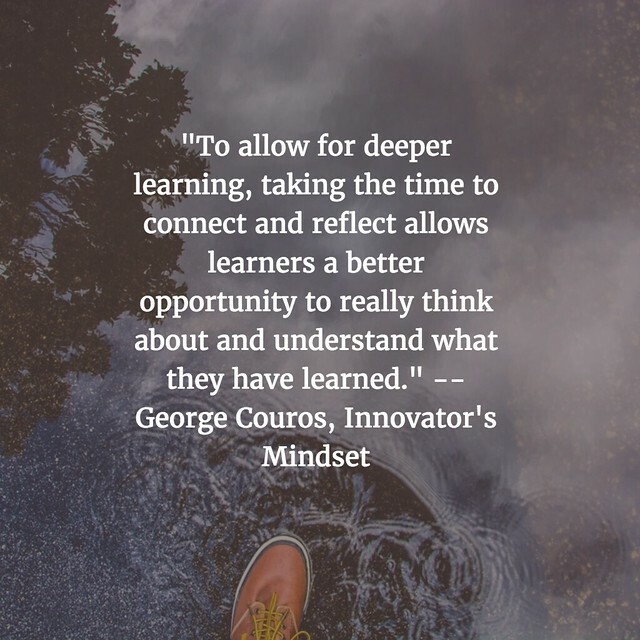 This entry was posted in Innovator Mindset MOOC, Slice of Life. Bookmark the permalink. As I was reading your post we shared a lot of the same thoughts. I was thinking “that’s a lot of steps to share your quotes”. I’m glad it seemed seamless and you have shared them masterfully. You chose perfect ones and have even inspired me to perhaps give it a try! I always love your reflections (and you have quite a knack for word choice and sentence fluency). It is always surprising what can feel seamless, because of practice, even though the steps are many. Have fun with your MOOC! I must read this book. I’ve missed following you. Sometimes I get lost in other pursuits but I always miss my slicers. I’m interested in how you do these cross platform thingies. I just taught my son to use Canva and I keep wondering if there’s a more seamless way. You are so inventive! I’m always amazed at the way you mix and match platforms.